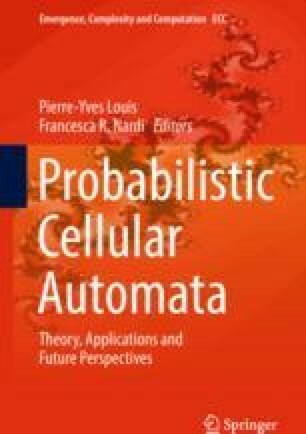 Probabilistic cellular automata (PCA) are used to model a variety of discrete spatially extended systems undergoing parallel-updating. We propose an embedding of a number of classical nonequilibrium concepts in the PCA-world. We start from time-symmetric PCA, satisfying detailed balance, and we give their Kubo formula for linear response. Close-to-detailed balance we investigate the form of the McLennan distribution and the minimum entropy production principle. More generally, when time-symmetry is broken in the stationary process, there is a fluctuation symmetry for a corresponding entropy flux. For linear response around nonequilibria we also give the linear response which is now not only entropic in nature.